I was very excited to hear about Confluences for many reasons. Language is also culture, and having more resources at the College in a variety of languages is imperative for community representation and growth. I’m personally delighted because I’ve been working on learning Spanish for a long time, although I still wouldn’t call myself bilingual. (I know, this is embarrassing given my age and the opportunities afforded me to learn it.) I anxiously await that moment of discovering I’ve truly become bilingual that Min Cheng described in her article of April, 2018. It is thrilling to have a College publication now with articles in Spanish and English to help me work toward that goal. My enthusiasm for Confluences also comes from my connection with Amherst College history. As the “Bicentennial Project Metadata Librarian,” I create metadata (descriptions) for things in the Frost Library’s Archives & Special Collections that have been digitized and will go into Amherst College Digital Collections (affectionately known as ACDC). These metadata descriptions help folks find stuff in our digital collections just like cataloging descriptions (i.e. title, subject, and author) of books and articles help users find things in our library catalog. Because I was specifically hired to work on creating metadata for resources that will help us celebrate the College’s Bicentennial in a few years and help folks investigate our 200-year history, I get to personally learn about some of our archival treasures, thanks to the hard work of past and present archivists. It turns out that Confluences is not the first multilingual publication founded at Amherst College. In the Amherst College Student & Alumni Publications Collection, there are at least two other multilingual publications created by Amherst College students or those affiliated with the College. 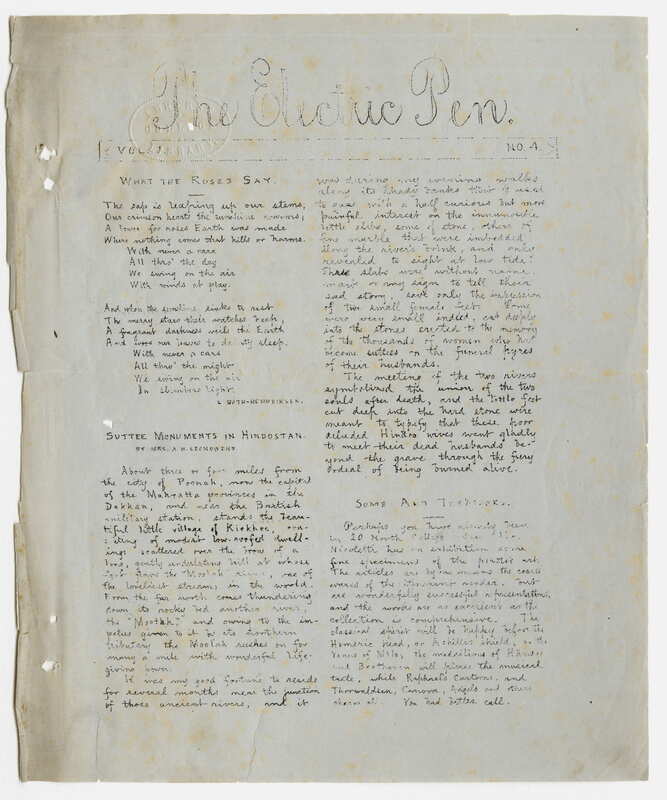 Way back in 1878, The Electric Pen published several issues, with articles on languages, language learning, lectures, or global art and culture. It also had translations, notices, a directory of local Amherst businesses, and poems, prose, and letters in languages such as English, German, French, Spanish, Latin, and Italian. It was devoted to the interests of the Sauveur Summer School of Languages at Amherst College and was presumably compiled by students in the school. The Sauveur Summer School was a “normal school” (an institution for teacher-training) that educated instructors who taught “ancient and modern languages.” Students wrote articles in The Electric Pen in a variety of languages including English, German, French, Spanish, Latin, and Italian. Like Confluences, this multilingual publication harnessed the developing technology of its day. It was titled The Electric Pen because issues were printed and duplicated using the electric pen technology invented by Thomas Edison. Edison’s electric pen was an intriguing device but ultimately proved less efficient than other printing methods; it became obsolete after 1880. It is historically significant to have something in our collections that was printed using this invention. The second multilingual publication at Amherst College was Polyglossos: The Amherst International Magazine. This was a student-run journal published from 1982 to 1984. 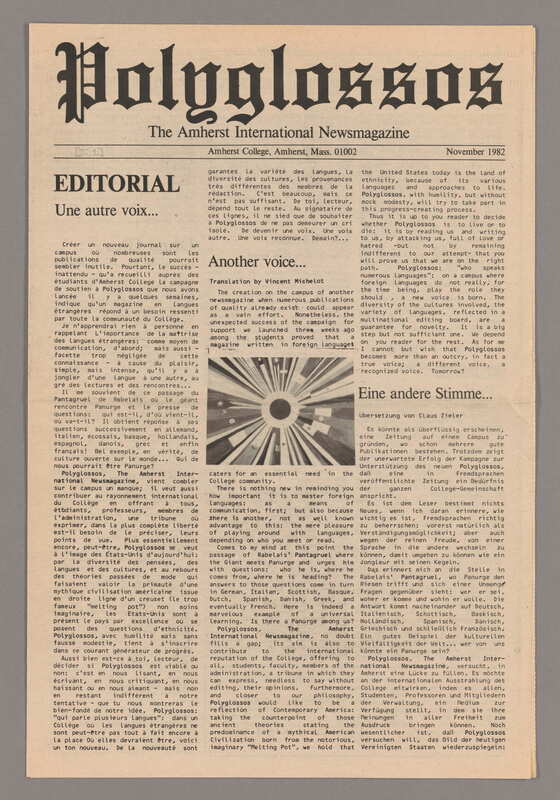 It aimed to “contribute to the international reputation of the College” and “to be a reflection of Contemporary America… the land of ethnicity.” Issues included articles written in a variety of languages such as English, German, French, Portuguese, Polish, Spanish, Russian, and Japanese. Like Confluences, it published creative work, as well as drawings, poems, and photographs. And now we have Confluences: Lost & Found in Translation! I’m confident that one day a future metadata creator will describe this publication, and they’ll get to write that it flourished for much longer than Polyglossos or The Electric Pen. In my hopeful vision, our descriptions will also be in multiple languages and more of us will be multilingual. And if I’m not dead or working for some futuristic robot overlord, I darn well better have finally become proficient in Spanish by then. If you’re interested in seeing Polyglossos or The Electric Pen for yourself, drop by Archives & Special Collections in Frost Library sometime and ask our awesome archivists. We’ll have the digitized versions up in ACDC sometime early in 2019 too. The electric pen, 1878 July, in Box 8, Amherst College Student and Alumni Publications Collection, Archives and Special Collections, Amherst College Library. Photographed by Amherst College Digital Programs. Polyglossos, 1982 November, in Box OS2, Amherst College Student and Alumni Publications Collection, Archives and Special Collections, Amherst College Library. Photographed by Amherst College Digital Programs.